Are you looking for a comfortable, stylish, and functional beanbag? Our newest piece of furniture, the CordaRoy's convertible beanbag chair, might just be for you. We recently finished our basement. It has great family room area - but it's not huge. How we use the space is this room has been key to the functionality of the basement. The kids use it for watching movies, entertaining friends, playing video games, and spend the nights. It also is our overflow guest area. When I found out I could get a COMFORTABLE beanbag that also converted into a bed, I wanted ONE! I cannot tell you what a great addition this beanbag has been to our basement - I tell all of my friends with kids that you NEED one of these! *I received our CordaRoy's in exchange for this review. I do not promote products unless we use and love them in our own home. In fact, I promote very few products on this site. All opinions expressed are my own. Why is CordaRoy's Better Than a Regular Beanbag? I will tell you about the CordaRoy's - and you will see why it's obviously better than a plain old beanbag. I was a bit skeptical, but after seeing them on Shark Tank, and now owning one myself, I can tell you this is a fun and functional piece in our newly finished basement family room area! Even my husband and I love sitting in the CordaRoy's. They are substantial and do not lose their shape when you plop down in them. You can tell just by looking at it that it will be better than your average beanbag. A CordaRoy's is filled with a patented foam - like MEMORY FOAM! I believe this is what sets it apart in the comfort department. My husband and I both have bad backs, and we can sit in the CordaRoy's easily - in fact we are choosing to sit in it! CordaRoy's truly convert into a BED. Our full size CordaRoy's converts into a full size bed, and that bed is actually comfortable. It is the PERFECT solution for our basement, where we need additional sleeping space. I wouldn't hesitate to have adults sleep on the bed, either. And, depending on the size of your CordaRoy's, it can convert into different sizes of beds - all the way up to a King Size bed. I love the selection of colors and fabrics that are offered. We chose a basic tan, but there are lots of fun prints (great for kids' rooms) to choose from. My CordaRoy's doesn't look "beanbag-ish" -- it is obviously of a high quality and something that makes a nice addition to our new family room area. CordaRoy's are practical and versatile. Each CordaRoy's cover comes off and is machine washable. (This is very good if you have stinky teenage boys in your house!) There are also a variety of covers so if you want to use it in a different room or decide to redecorate, simply purchase a new cover. Converting the CordaRoy's into a bed is also EASY (more on that in a minute). It takes all of 2 minutes. CordaRoy's come with a LIFETIME GUARANTEE. CordaRoy's customer service is second to none, and when you call their support number you actually get a HUMAN answering right away. The company has been in existence for 15 years and that tells me something, too. The best way to see how a CordaRoy's works is to watch the video below. It really is as easy as shown in the video. I can convert the beanbag into a bed all by myself in about 5 minutes. If I have a helper it goes a bit quicker. As you can see, it's quite a substantial bed that fits inside the cover! Our basement area isn't huge, and we are trying to maximize space. 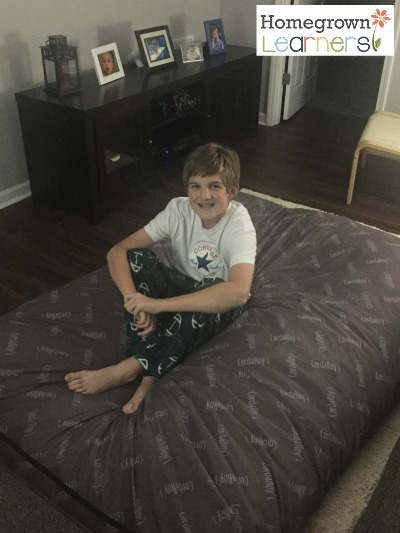 This beanbag is perfect because it can be used for gaming and watching movies, and then converts to sleep 2 when friends spend the night or the kids just want to sleep in the basement. To find out more, simply visit the CordaRoy's website. It shows you all of the sizes, fabrics, accessories (they also have footstools and pet beds), and has quite a large section of testimonials. I think think you will be quite impressed. CordaRoy's is offering Homegrown Learners readers a 10% discount and FREE Shipping on any order. Simply use the code VPSD and they will know I sent you. I sincerely hope you can use and love a CordaRoy's - it's the best thing I've come across in quite some time! I have one child who learned their multiplication facts very easily - with simple drill and repetition and written drills every single day. My other child, however, needed something more than drills. She needed creative ways to learn her times tables - games, songs, manipulatives. You name it, we did it. Oh -- and don't forget the flashcards - flashcards are a must for learning times tables! The fact is this: not all children learn in the same way, so when I approach any subject I know that one size never fits all. This is ESPECIALLY true of math. If straight drill and repetition doesn't work for your child, you might want to try a few different things that will help cement those all-important facts. Because I will tell you -- knowing multiplication facts is INTEGRAL to all future math success. *I have been compensated to write this post. All opinions are mine and I never recommend anything my children don't use and love. Sometimes HEARING those times tables over and over can really help. We love our Classical Conversations memory work CDs for our times tables, but before we did CC (and when I taught elementary school) I had a couple of tried and true resources. Hap Palmer's Multiplication Mountain is catchy and fun -- was DEFINITELY a favorite in my house! Some kids need to experience the times tables tactically to achieve understanding and mastery. My son, when he was just preschool age, started showing signs that he learned this way, and I am so thankful I followed his lead. It made both of our lives so much easier when I respected his learning style! Unifix Cubes are a versatile manipulative for learning all kinds of math facts. Multiplication Wrap-Ups - if you don't know about these you are MISSING OUT! We loved learning our facts with these. LEGOS - Some kids just speak LEGO, know what I mean? Using LEGO bricks for teaching multiplication can really engage those kids! Some children have to SEE IT to remember it. One of my kids has a lot of visual learning tendencies, and the multiplication tables suddenly clicked for him when did simple multiplication coloring charts. I would print the number charts and have him color the multiples of whatever number we were working on that day. Because he loved coloring and because he loved patterns this was a HUGE hit with him. A way to learn multiplication facts that appeals to everyone is through games. We love playing multiplication card games. Recently we have also discovered a new multiplication game from Logic Roots (which leads me to the point of this post -- to tell you about our favorite new game!). I knew the game would be good because we enjoyed Ocean Raiders (an addition game) very much! Say Cheese is designed to help children practice their multiplication facts (2-10 to be exact). Designed for grades 1 and up, it provides children an opportunity to practice their facts repeatedly and while having FUN - so they don't even realize the work they are doing. I played the game with my son and his good friend -- both boys are pretty good with their times tables, but they are working on QUICK RECALL of those facts in preparation for upper levels of math. They are both currently working in Saxon 7/6, so all of the skills practiced in this game are skills they have been working on ALL YEAR. They enjoyed the game very much and agreed that it was MUCH BETTER than doing a Saxon lesson! With Say Cheese, you get 14 times more practice of multiplication skills. Game play is very simple. Each player has a cute little mouse pouch of "cheese coins". The "cheese coins" are distributed equally among the players. The first player chooses which times table they would like to practice - let's pretend it's 4. The next player takes a coin from their bag and throws it into the arena... let's say the number on the coin is 34. If that coin is a MULTIPLE of 4 then the player says "CHEESE" and gets to take the coin from the arena. Well, we know 34 isn't a multiple of 4, so play continues. Perhaps the next coin thrown in is 81. 81 isn't a multiple of 4, either. Play continues. The next player throws in the coin with the number 20 on it. That player says "CHEESE" because it is indeed a multiple of 4. The player says "4x5=20" and can then collect all of the coins from the arena. Play continues until one player runs out of coins or until a set time amount is finished. It's up to you. Some of the times tables are easier - like the 2, 5 and 10 times tables. Other tables are harder, so more thinking was required. We also liked that there were several ways to make the game more challenging for older students. The game can be easily mastered by a first grader, but is still engaging for a sixth grader. The Say Cheese game includes slates to write on in case kids want to write out their times tables to help them (they might be a visual learner). It also includes a fun poster to hang in your school or home, and a thorough directions book. It was a pleasure to try this game, and I know it will be a staple in our homeschool as we works towards increased automaticity with our times tables. So, if you want to make multiplication a little more fun, you might want to investigate Say Cheese. In fact, Logic Roots has MANY math games - for all age and skill levels. What about you? Do you have a good way to learn multiplication facts? Leave me a comment below and share!